The Pharoahs Are Dead - delve into the Underworld - ruled by the God Osiris . One part of Ancient Egypt. 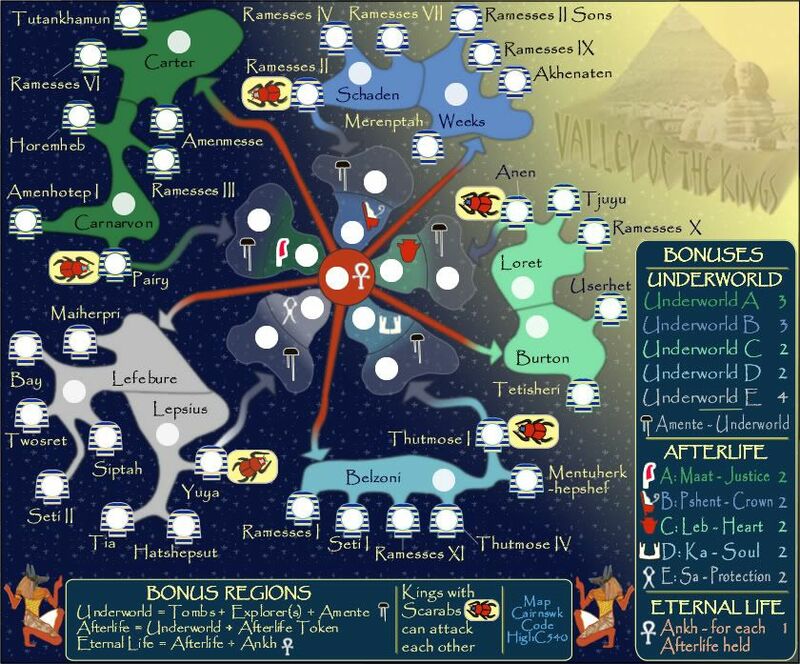 The bonus legend is explained on the map, but if you don't understand, then please enquire. I'm sure you'll enjoy! I had immesne fun creating this. Last edited by cairnswk on Fri Sep 10, 2010 6:12 am, edited 52 times in total. so let me get this. if you hold tombs 1 which btw has only one border tr1 so it easy to hold, i get +2. if i also hold ankh i get another 7 for a total of 9??? Last edited by DiM on Sat Apr 21, 2007 7:45 am, edited 1 time in total. DiM wrote: where's the image? needs working on, do you think? although DiM, it may take some getting to that stage, so it might be worthwhile that 9 bonus. i'm not going to say anything about the graphics yet because there's no point working on that until the gameplay is clearly defined. so about the gameplay. i clearly see a problem with the afterlife bonuses. let's say i'm lucky enough to get 2-3 of those bonuses. my first move would be to eliminate oposition in the afterlife circle and fortify KA. this way i have all the afterlife bonus regions defended by only one terit with massive troops. then my second thing would be to get the crapiest easyest continent like tombs 2. i go from KA to tr3 and get tombs 2.
now with only 2 borders KA and TR3 i'll get a huge 30(!!!) army bonus. now the game is mine. i simply put that whopping 30 army bonus in KA and go to all the TRs and kill everybody. i think you should cut down the afterlife things to only 5 and make one for each continent. make them worth 1 or 2 but only for their coresponding tombs. something like a capital bonus on other maps. another big problem is the ability to move around the map. maybe make the scarabs able to attack eachother as well not only the KA. DiM wrote: i think you should cut down the afterlife things to only 5 and make one for each continent. make them worth 1 or 2 but only for their coresponding tombs. something like a capital bonus on other maps. Yes I can understand you're thinking there, i will have to muddle over all that, and probably adjust something. Not sure what yet? i said i won't comment about the graphics but the tombs words are hurting my eyes. while i do understand you'r trying to recreate the effect from the pharaoh thingys they have on the head ( ) it's still disturbing. write the names in simple fonts and add little thingys near them. 1 thing before I will make a more detailed study, perhaps make continents with 1 color, I know it isn't historical correct, but now you make people wonder what is what. I think, and this will be harder to do but shouldn't be too bad. Is you have the legend colors be horizontal stripes on all the numbers like you do for the actual territories instead of alternating. Also, all of them have 1 border if you hold the whole thing. But that doesn't make it easy. If someone breaks that 1 border they can attack everything you have. I'll be back when it's been simplified. It's a good idea with strong potential, but... it's just too much right now. why is the tomb bonus legend all different colors? are you trying to make this complicated? IN line with some of the suggestions made thus far above, I have made several changes. * 4 of the tomb regions now have double borders because the tomb robbers are increased from 1 to 2. * changes to the legend using the cartouche symbol of enclosure. * scarabs can attack other scarabs as well as the Soul. mibi wrote: why is the tomb bonus legend all different colors? are you trying to make this complicated? On the V2 you will see the change. Much better now eh? Yes I started also Nikolai...and got severely lost, but it will come together...that is what the foundary does so well. onbekende...new V2 should help sort this out....hope it does for you! i like the overal idea of this, especially the afterlife part, but what is the overall shape suppose to be? river? family tree? mibi wrote: i like the overal idea of this, especially the afterlife part, but what is the overall shape suppose to be? river? family tree? Mibi...all these tombs are located in a valley in Egypt (check Valley of the Kings on Wikipedia), and the access pathways between the tombs are the coloured areas that I have called TR1, TR2, TR3 etc. There are many more tombs in reality than what is shown here, but this is a selection of those tombs. More tombs and anti-chambers are still being discovered in this modern day. The afterlife stands as a completely separate entity because is it spiritual and the deceased pharoahs used these afterlife attributes to take with them on their journey into the spirit world. These connecting pathways/territories also stand in the map/game for Tomb Robbers....imagination is a wonderful thing! hmm, does seem rather complicated- but interesting. im not a fan of the colours, they dont seem to follow the egyptian theme very well. the hyroglyphics colours do though- is it possible to mimic those same colours in the continents? also, the title needs some help. looks too much like word art. Enigma wrote: hmm, does seem rather complicated- but interesting. I'll see what I can do...I am currently re-qorking the entire design to put that Afterlife in the middle somehow...so will also attempt colour changes while I am at it. think about reducing the number of afterlife terits to 5 and make one afterlife bonus for each continent. i the current system getting the afterlife circle and a continent gives way too much bonuses. DiM wrote: think about reducing the number of afterlife terits to 5 and make one afterlife bonus for each continent. i the current system getting the afterlife circle and a continent gives way too much bonuses. Yes DiM...that is in progress as per your suggestion. thanks. this would definitely balance the gameplay. how do you attack the glyphs? the legend says the soul can only attack the TRs. it seems that what you are trying to do is develop a new gameplay idea where the continents themselves arent worth very much. this is made up for with high single territory bonuses, which dont take effect until after the continent is held. is this a correct read? Enigma wrote: how do you attack the glyphs? the legend says the soul can only attack the TRs. Yes Enigma, that was kind of what i had in mind...one would get a small bonus for holding the continent, but if you held one of the glyphs then it would be worth a whole lot more. And there is no link between the tombs of the pharoahs...in order to attack a tomb you have to first dispose of the tomb robber waiting outside on the pathway....that's why there is no direct link between tombs apart from the robbers pathway. cairnswk wrote: * The Afterlife Soul can attack the tomb robbers, as well as Afterlife Bonus Glyhs. the legend isnt entirely clear- it says the the soul can only attack the TRs. i thought that meant it for some reason _couldnt_ attack the glyphs.